With its rolling hills, rocky peaks and multitude of colours, this otherwordly visage looks like no place on Earth. 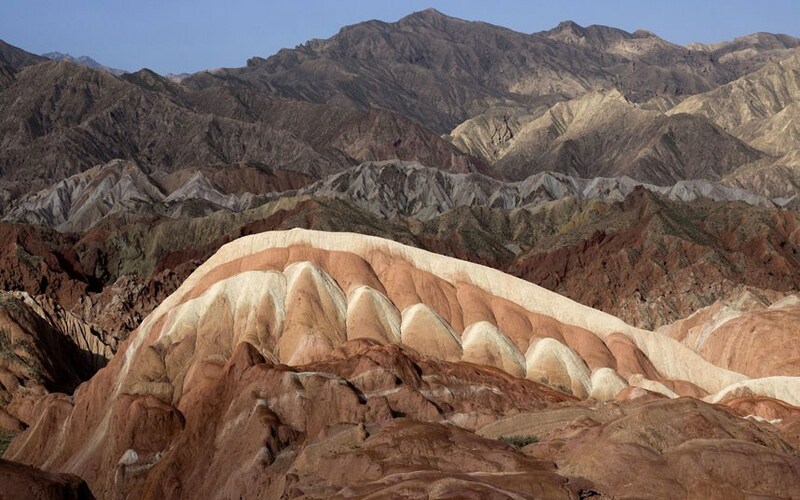 However, the spectacular lunar landscape can actually be found at the Zhangye Danxia Landform Geological Park in Gansu Province, China. Like one giant red, orange and yellow-hued paint spattered artwork, the park offers breathtaking views that blaze with colour. The unusual colouration in the rocks is the result of red sandstone and mineral deposits being laid down over 24 million years. The resulting ‘layer cake’ was then cleaved and buckled by the same tectonic plates responsible for parts of the Himalayan mountains. Wind and rain finished the job by carving the striking formations, which are known as ‘danxia’ and can only be found in China, into weird and wonderful shapes. The end result of all these different factors are waves of rock layers – including dramatic natural pillars, towers, ravines, valleys and waterfalls – that differ in colour, texture, shape, size and pattern.